Tampere DX-listeners new dx-cabin with several beverages was installed in Niihama in autumn 1993. Finally in Christmas Eve night December 23rd 1993 first logging from N-cabin was made by VJR: 1458 Sunrise Radio, London 1458 and then R Tropical, Barra do Carças MG 4855. During first 21 days, until winter solstice, target is reached, although in the beginning of the month conditions on MW were rather lousy, and during last week even declined. Typically MW band has offered several peaks on TA-frequencies, but signals have been in trouble with noise level and deep fading. Readable audios haven´t been too many and often hard to find. 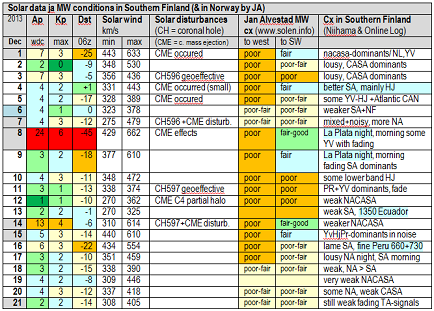 To the table below is compiled some solar and MW condition data from these 21 days: Last columns’ remarks are based on the Online Log and on my own subjective observations on the band, mainly in the mornings before local sunrise. Of course especially now in the era of SDR and trawl recordings all loggings are not yet known. On the other hand, because of so lousy conditions, not so many recordings are likely. My monitoring is made using N-cabins´ 830 meters beverage directed to Columbia and Venezuela (277°), remote via net. The antenna works well also to Puerto Rico and Newfoundland or Peru, but doubtlessly not so well to La Plata or to inland USA. Conditions ranked by JA are included for comparison, but naturally cx in Southern Norway are often strongly different to those here in Southern Finland, not to mention in Lapland. PS: Please note that Niihama NA-statistics are now updated by MCK (right top corner in the blog). From the upper right hand side corner of this blog page you´ll now find an updated list of Latin American (CA & SA, including the Caribbean) MW-stations identified and OLL-logged using beverages of Tampere DX Club listening cabin. Niihama is located only some 6 km from the Tampere city centre, but in the middle of the forest. The main listening period in the N-cabin is generally concentrated to the period from October to January, so this update period from January 2013 to early December 2013 contains already some new stations. Of course the current solar phase very near the sunspot maximum and the polarity change of magnetic field affects strongly too, even though this maximum is supposed to be the lowest in 100 years. 113 CA-stations. The most remarkable new station is by JPF logged CMBQ Radio Enciclopedia, La Habana 530, a new TA-frequency as well. This cubano game nicely during January 2013 top NA-conditions. There are now 44 different Cuban stations identified using Niihama DX-cabin beverages, while on the 2nd place is still held by Puerto Rico with 22 stations and the 3rd by Mexico (12). Winter 2011-12 is overwhelmingly number one in amount of loggings by 67 stations, while this MW-period so far by 31 is still already ahead of the previous period. 192 SA-stations. In the updated South American list the most “historical” point is the successful catch of two new MW-countries: Guyana 560 and Paraguay 920. In the country competition Colombia leads Venezuela with basketball numbers 87 – 62. Peru has 13 stations in the list while Ecuador 12. Most embarrassing is that from the huge Brasil there is only 9 stations logged and from Argentina only 6 – and Uruguay is still totally missing from the list: Who will be the first happy fellow catching Uruguay in Niihama (or later from the SDR N-trawl)? – The most powerful SA-period in N-history in clearly 2010-11 by 99 loggnings. The current ongoing period isn´t yet in the midway, so total 53 is not bad, and there is more to come. CASA-list of Niihama (/N or /Ne in loggnings, e = remote via net) can freely be exploited by every DXers: In addition to N-activists, perhaps this list could somehow be useful also for other beginner or moderate level MW enthusiasts listening in southern Finland in order to get a wide general view to the Latin American MW band, i.e. what kind of stations can be expected when tuning to those most exciting zero ending TA-frequencies.